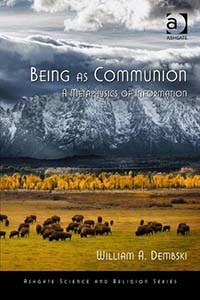 I’ve now finished William Dembski’s Being as Communion and I have to say it’s probably had the most significant influence on my thinking of any book I’ve read in the last year or more, not excluding Polanyi’s Personal Knowledge, which incidentally he cites with understanding, as he does a wealth of other sources we’ve used on The Hump, from Ed Feser to Owen Barfield. Whether the world will agree with my positive assessment of the book is less certain – Polanyi didn’t have to cope with being stigmatized as a Fundie Creationist in a culture war. I think that materialist metaphysics is so deeply embedded in our psyche that Dembski will faze even many of his own ID constituency, as well as being instantly dismissed by those materialists who don’t even realize they operate under metaphysical presuppositions. Such are our times. There are just too many new ideas, explanations of and developments from his previous ideas, and links to other thinkers for me to do a decent review here, though I feel I ought to as there isn’t much comment on the web as yet – it’s a book that is a lot more challenging (of presuppositions more than the little grey cells) than, say, Stephen Meyer’s Darwin’s Doubt. The subtitle of the book is “A Metaphysics of Information”, and that’s exactly what it is and, to my mind, exactly what is needed to push the basis of science forward from the failures of materialism in this information age. Dembski, as I briefly mentioned in the last post, is seeking to extend and codify (mathematically, of course, given his background, though he avoids most of the maths here) the ideas of physicists John Wheeler and Paul Davies in placing information as the prime reality of the universe over matter and energy. He even goes so far as arguing (cogently, but on his own admission slightly polemically to provoke us to thought) that matter itself is a myth, since it can never be perceived apart from the information we receive about it through our senses. He has no concept, however, that reality is an illusion just because information is primary – rather he aims to show us how information is more solid a concept than we assume under materialism, and matter a less solid one. A few of the fascinating themes covered in 203 pages are: the philosophical problems of materialism; the nature of free will and how it relates to information as the diminution of uncertainty (or ruling out possibilities); the separation of the real world from other possible worlds; the measurement of information; information theory; the reinstatement of teleological laws into nature and their relation to theism (and to intelligent design as a discipline – which he sees as understanding the teleology, whatever its source, that is denied by materialism); the relationship of matter to information; the embodiment of information; an informatioanl approach to energy; the refutation of the idea that the universe can be informationally closed; the nature of determinism and contingency (including an intriguing description of probability distributions as the signatures of intelligence); search and the Conservation of Information; the relationship of this last to the hidden requirements of natural selection; the creation of information both in a theistic and non-theistic framework; and finally a summary chapter which spotlights the concept of the title – that the communication of information is what it means to exist, and the scientific and theological ramifications of that. In all of this I note what I found when I read his Nature of Nature symposium: that he is careful to connect his thinking, where possible, with that of others, whether theists or not. His opponents are more notable for suggesting that nothing he has ever written relates in any way to serious work. But it does. He’s extremely well-read and a profound thinker, and unlike some one could name understands his sources and treats them with respect, noting where they disagree with him as well as where they back him up. So all in all, I’d place this book as my “Hump bibliographic recommendation of the year.” And if you don’t like it, at least you’ll have some clear ideas to disagree with. I’d like to draw one specific lesson from Being as Communion, and that’s in relation to that sense of frustration I continue to feel about much of the Theistic Evolution project. I’ve commented not infrequently on matters of metaphysics and metaphysical theology, for example, in suggesting that Theistic Evolution’s concentration only on efficient causation will inevitably produce a mismatch when it comes to perceiving God’s final and formal causation in the world. I now see more clearly, I think, that many of the problems with TE’s approach to divine action (and even its comprehension of the issue of “design”) stem from the cognitive dissonance of trying to maintain a materialist metaphysics in conjunction with non-material concepts like information – or more importantly, the divine. Let me unpack that a bit. Materialism inevitably deals very badly with non-material concepts. One thinks first of the supernatural – God having been written out of first science, then the world. But mind, consciousness and will are all problematic, being initially hived off to some nebulous realm (as by Descartes) and then progressively reduced to epiphenomena, even though they are the first and only essential for doing science. One could also mention other areas which can only be managed, under materialism, by total denial (such as premonition, intuition or prophecy); and others like the interpretation of quantum theory or information itself, which like mind can only be reduced unsatisfactorily to matter. One might add that all emergent phenomena – from the special properties of chemical compounds to such proposals as convergent evolution and – most of all – teleology in nature, fit badly into the materialist scheme, and are sidelined in science as a result. Let me return to the example of mind, consciousness and will. Although rigorous materialists will attempt ways to deny the reality of these, for most people (such as most working scientists) they are the elephant in the room, undeniably real and at the very centre of all experience, but conveniently bracketed apart from the materialist treatment of the rest of the world and forgotten, though they are really a cancer eating away at the entire metaphysical edifice. Such people are practical materialists, who manage by selective inattention to keep their own daily subjective experience out of their explanatory matrix. They live as if choice, consciousness, beauty, morality and so on are real, but somehow blind themselves to the fact that these fly in the face of the materialism they embrace in theory. Theistic Evolutionists, it seems to me, have tended to do something of the same thing with God. Their basic world is one that operates on materialist principles. This may be justified on some theological grounds like the autonomy of nature which, however, needn’t be rigorously argued because its main purpose is to leave practical materialism undisturbed in daily life. In principle they (often) accept biblical miracles, as these are are safely in the past, yet without explaining how these anomalies actually fit into the causally-closed natural world for which they argue. This is problematic for more immediate questions like answered prayer or personal guidance too, but one seldom sees any attempt to integrate these into the basic understanding of reality, in just the same way that non-believers quietly leave their own minds out of their theory of reality. As far as I can see, then, accommodating faith to “good science” is on a hiding to nothing while science remains founded on “practical materialism” (which may perhaps be the same thing as Robert Boyle’s “mechanical philosophy” of a pre-quantum and pre-information century, though it’s likely his use of the idea was far less rigorous). What is needed is nothing less than the adoption of a different metaphysics, and that is a major intellecual paradigm shift, not just an aceeptance of evolution and a denial of Creationism. Aristotle’s old one has something to offer, and so maybe has William Dembski’s new one – they actually have a certain amount in common. Ironically, I find further information on this in footnote 36 of Robert Bishop’s essay on Methodological Naturalism, following his BioLogos critique of Stephen Meyer’s recourse to intelligence to explain the Cambrian Explosion and the origin of life: “However, for Boyle, MN did not extend to the origin of matter, or living creatures; God created these immediately rather than mediating them through natural processes (Edward Davis, private communication).” Did Boyle lose his grip here, or is MN applied too strictly in today’s science?